Our colleague Linda Spedding, the international lawyer who is responsible for our Indian contract templates, has published an informative book on Indian business law and regulation. 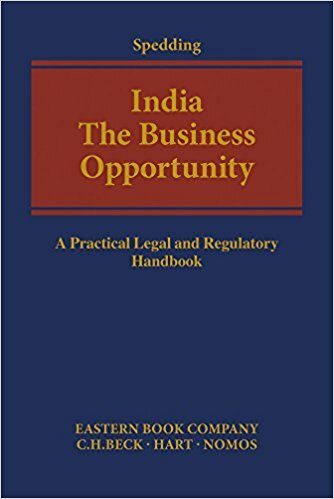 India: The Business Opportunity is a practical and legal handbook for anyone wanting to invest in the country. Edited by Linda, the handbook has chapters contributed by experts on their particular subject and a foreword by India’s foreign minister. A recent review for the UK-India Business Council says it encompasses nearly every existing law and regulation necessary to set up or run a business there. It covers entry strategies and investment regulations, raising finance, taxation, dispute settlement, arbitration, environment, labour, competition, intellectual property, mergers and acquisitions, competition, cyber laws, etc. It also has guidance on corporate governance, procedures for compliances and risk management. Altogether, it is a comprehensive and unique publication to help any new or existing investor with almost every aspect of business law in the way. This entry was posted in Business in India and tagged india business, law in india. Bookmark the permalink. You should sleep as little as you can, and try and change the world.